Acrobatics is most often associated with activities that make extensive use of gymnastic elements, such as acro dance, circus, and gymnastics, but many other athletic activities including ballet and diving also employ acrobatics. Although acrobatics is most commonly associated with human body performance, it may also apply to other types of performance, such as aerobatics. Aerobatics is the practice of flying maneuvers involving aircraft attitudes that are not used in normal flight. Aerobatics are performed in airplanes and gliders for training, recreation, entertainment and sport. Some helicopters, such as the MBB Bo 105, are capable of limited aerobatic maneuvers, and Chuck Aaron is the only US pilot certified to do helicopter aerobatics. The term is sometimes referred to as acrobatics, especially when translated. Acro dance is known by various other names including acrobatic dance and gymnastic dance, though it is most commonly referred to simply as acro by dancers and dance professionals. Acro dance combines classical dance technique with precision acrobatic elements. 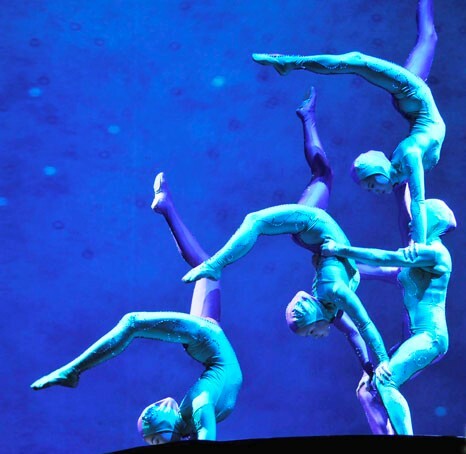 It is defined by its athletic character, its unique choreography, which seamlessly blends dance and acrobatics, and its use of acrobatics in a dance context. It is a popular dance style in amateur competitive dance as well as in professional dance theater and in contemporary circus productions such as those by Cirque du Soleil. This is in contrast to acrobatic, artistic and rhythmic gymnastics, which are sports that employ dance elements in a gymnastics context under the auspices of a governing gymnastics organization (such as FIG) and subject to a Code of Points.